Situated in the heart of Porlock, the Gateway to Exmoor, Clive Downs has been serving the community and visitors to the village for over 26 years. In May 2017 Derek Weeks a Butcher with almost 40 Years experience and his Family took over the reigns expertly assisted by Andy who has been part of the Clive Downs experience for over 11 years. From Locally sourced Lamb to delicious Venison sausages, all expertly prepared on the premises, you can be guaranteed of top quality meat, pies and pasties every time. All our Produce is Locally Sourced and Outdoor Bred. To pre-order meat or make an enquiry, telephone on 01643 862667, write to us on the "Contact Us" form, or just call in and browse. 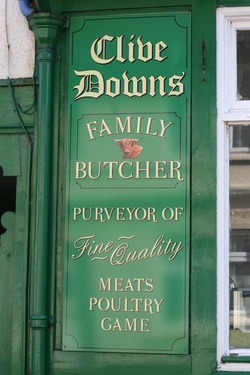 ​You can also join us on Facebook..... Clive Downs Butchers.....pop on by and give us a like! Look out for Derek's Special Offers too!